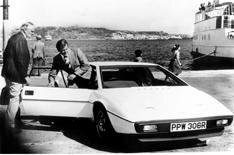 James Bond's Lotus Esprit sold | What Car? James Bond's Lotus Esprit from the film The Spy Who Loved Me has sold for 111,500 at auction in London. The 1976 Lotus was one of two Esprits featured in the film the car offered for auction was the one that stayed on land - rather than the one that Bond drove underwater. The car was bought by a US-based bidder who preferred to remain anonymous, but who described himself as a Bond and Lotus fan. It has been a good year for James Bond memorabilia, with an Aston Martin DBS that was crashed during the filming of Quantum of Solace going for more than 200,000 - despite being severely damaged. The list price of a new and pristine DBS is 160,000.